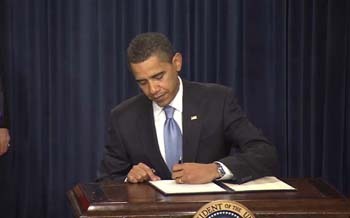 President Obama signs his Freedom of Information Act Memo on January 21, 2009. "Report Faults U.S.'s Efforts at Transparency"
"FOIA-request audit shows response to Obama transparency pledge is uneven"
"Eye Opener: Is Obama's government open enough?" "Agencies lag in following Obama's openness order"
Washington D.C., March 16, 2010 – Marking Sunshine Week and James Madison's birthday, celebrated as Freedom of Information Day, President Obama today called for redoubled efforts towards more open government, while his chief of staff and White House counsel specifically directed agencies to revise their Freedom of Information guidance and practice towards greater disclosure. The President's statement that "our work is not done" recognized the same reality found by the National Security Archive's FOIA Audit released earlier this week, that federal agencies were lagging behind White House leadership on fulfilling the orders and directives on FOIA issued by President Obama on his first day in office, and by Attorney General Holder during last year's Sunshine Week. "The Obama administration deserves an A for effort," commented National Security Archive director Tom Blanton, "but an Incomplete for results. We concluded it's too soon for a final judgment, that some agencies were achieving best practice, but most agencies had yet to walk the walk." Blanton noted that the Archive's audit specifically called for continued pressure and leadership, both inside and outside government. "Today's statements from the White House, and yesterday's speech from the Attorney General, send a clear message to the agencies," said Blanton. "That's one of the key factors we've found over years of experience that make a difference in how agencies treat the public." The White House memorandum from Chief of Staff Rahm Emanuel and Counsel Bob Bauer should be particularly helpful since one of the Archive's audit findings was that only a minority of agencies had already updated their FOIA materials in response to the Obama and Holder memos. For more on the White House reaction to Sunshine Week, see The White House Blog. Ancient requests--as old as 18 years--still persist in the FOIA system. Only four out of 28 agencies reporting--including Holder's own Justice Department--show releases up and denials down under the FOIA. The Audit, which is based on data obtained from government agencies through FOIA requests filed by the Archive in September 2009, found that federal agencies had a wide range of responses to the Obama and Holder Memos. Some agencies (13 out of 90) implemented concrete changes in practice as a result of the memos; some (14 out of 90) have made changes in staff training; and still others (11 out of 90) have merely circulated and discussed the memos. The remaining agencies (52) either told the Archive that they have no records that demonstrate how they implemented the Obama and Holder Memos or did not respond at all to the FOIA request. The report also shows several agencies have severe backlogs in processing FOIA requests, with some requests as old as 18 years. Presidential Libraries are facing some of the greatest challenges processing old requests--the libraries for Presidents Ronald Reagan, George H.W. Bush, and Bill Clinton all have requests pending from the first year they began accepting records requests from the public. National Security Archive Director Tom Blanton said the Audit makes it clear that too many government agencies are falling short of the goals set out by President Obama. "It is time for a 'No FOIA Request Left Behind' initiative," Blanton said. Meredith Fuchs, the Archive's General Counsel, said the Audit shows the Obama Administration and federal agencies have their work cut out for them on the transparency front. "One year is too early to render a final judgment on how far President Obama can move the government toward openness, but this Audit finds that much more pressure and leadership will be necessary, both inside and outside the government," Fuchs said. On March 17, 2000, Long Island University named the National Security Archive as winner of a Special George Polk Award for 1999 for "piercing self-serving veils of government secrecy" and "serving as an essential journalistic resource." The National Security Archive FOIA Audit has been made possible by generous funding from 2002–2009 by the John S. and James L. Knight Foundation, and by the support of the Open Society Institute, the HKH Foundation, and the Stewart Mott Foundation.